Read the rest of this post for an overview of how livestock production affects wildlife and wild lands, and be sure link out to the other articles, reports and documents provided for more thorough coverage of this issue. This issue of livestock and wildlife sustainability has been on many minds here in Washington because of the recent slaughter of the Wedge wolf pack. The crux of it is that the protestations of one cattle rancher resulted in the killing of Washington’s pack of gray wolves. The Washington wildlife department made the decision to kill all members of the pack in response to a rancher who showed a clear anti-wolf agenda from the start. He was even offered free measures like ranch riders as non-lethal deterrents, but he refused. He was grazing his cattle, unattended, on public lands where predators were present. In the eleven western states, 70 percent of the land area is grazed by livestock. In terms of the extent of area affected, other types of land use like logging, mining, and crop agriculture pale in comparison. Significantly, in the 1990s, the normally staid scientific community began to speak with a firmer voice. The American Fisheries Society, the Society for Conservation Biology, and the Wildlife Society all endorsed formal position statements on the nefarious biological consequences of grazing. “Livestock grazing . . . has a host of negative ecological repercussions. . . . Much of the ecological integrity of a variety of North American habitats is at risk,” intoned the conservation biologists. “The inherent productivity and ability to sustain fish, wildlife, and livestock is in jeopardy,” echoed the wildlife biologists. Related to this issue of predator killing and livestock production is the article I wrote about a few months ago — the Sacramento Bee exposé on USDA’s Wildlife Services and their record of ruthless practices toward wild animals, often at the bidding of ranchers, some of whom run their cattle on public land. The three-part series is a difficult read because of the cruelty depicted, but it’s worthwhile to understand the full scope of the problem if you haven’t yet seen this investigative piece by Tom Knudsen. The connection between all of these vignettes is that commercial livestock farming, particularly if done without any sensitivity for rotation grazing or the type of habitat, is responsible for various ecological problems that relate directly to the preservation of our wild lands and our wild animals. Livestock grazing can affect habitat, waterways, mammals, birds, fish, plants and climate. It’s an issue wildlife watchers, photographers and birders don’t always connect directly to the well-being of wildlife, often because livestock production such an entrenched facet of our system, with many industry and political mechanisms in place to obscure the truth of its real costs. A 2006 report, Livestock’s Long Shadow, from the Farm and Agriculture Organization of the United Nations (FAO) counted livestock as a major threat to the environment and contributing about 18 percent of greenhouse gases. Elements of that report were challenged by animal scientist Frank Mitloehner of UC Davis. 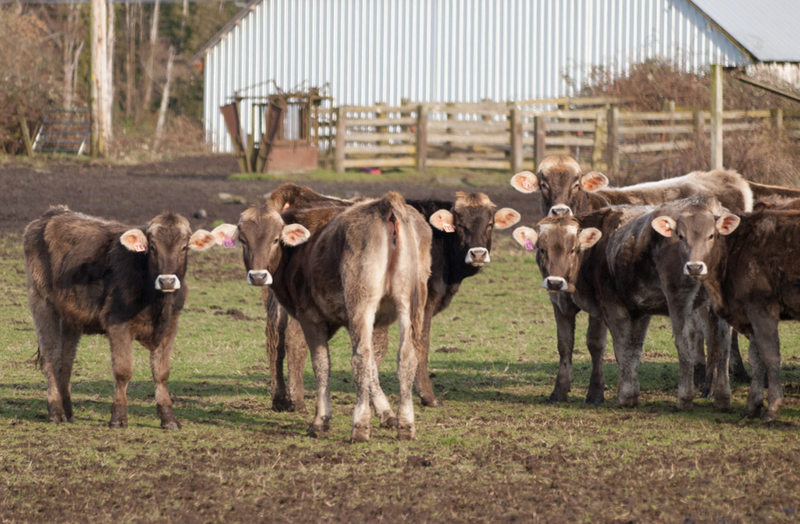 His conclusions were used by various members of the livestock industry — one example — to refute the stated impact of livestock production on climate change. In July of this year, Mitloehner was made chairman of a partnership between the FAO and livestock industry groups. So the only pragmatic way left to reverse climate change before it’s too late, say World Bank environmental advisor Robert Goodland and his colleague Jeff Anhang, is through large-scale reforestation and regeneration of forest to absorb today’s excess atmospheric carbon –- combined with replacing at least 25% of today’s livestock products with better alternatives (notably, meat substitutes). That way, lots of greenhouse gas emissions attributable to livestock would be significantly reduced at the same time as new trees would sequester excess atmospheric carbon. Fresh water, like land, seemed inexhaustible for most of the first 10 millennia of civilization. So, it didn’t seem to matter how much a cow drank. But a few years ago, water experts calculated that we humans are now taking half the available fresh water on the planet—leaving the other half to be divided among a million or more species….If we break it down, species by species, we find that the heaviest water use is by the animals we raise for meat. One of the easiest ways to reduce demand for water is to reduce the amount of meat we eat. In my various readings, I came upon this talk (video below) given to the Northwest VEG organization by ecologist George Wuerthner who discusses grazing issues, with an admittedly anti-grazing bent. He covers a lot of ground with respect to the environmental costs of livestock production. He talks about the biodiversity and riparian area destruction. Wuerthner has photos to illustrate the contrast between grazed riparian areas and intact zones, some photographed just across a dividing fence line separating grazing from non-grazing areas. He also delves into pollution issues and the reality of predator control (coyotes, prairie dogs) which are all fueled by livestock interests. He shows the wasteland created on refuges when water is diverted away from important habitat and toward irrigation, much of it going to crops used as livestock feed, monocrops which in turn displaced biodiversity. If my biologist, ecologist or farming friends here have anything to add, please feel free to leave comments. I am always interested in information that will further enhance my understanding of the issues. A number of Wuerthner’s points are reliable in terms of the environmental impact. Clearly, the direct effect on predators and “vermin” animals through ranching and farming depredation services is irrefutable. As part of a growing chorus of citizens, environmentalists, biologists, wildlife advocates and others, I believe one of the strongest statements we can send in terms of ending these unsustainable practices, is to vote with the dollar and fork, and reduce the demand for products from industries that violate tenets of environmentalism and concern for wildlife and wildlife habitat. Albert Einstein, who was better known for his physics and math than for his interest in the living world, once said: “Nothing will benefit human health and increase chances of survival of life on Earth as much as the evolution to a vegetarian diet.” We don’t think he was just talking about nutrition. Notice that in this article we haven’t said much at all about the role of meat in nutrition, even though there’s a lot more to talk about than heart disease. Nor have we gone into the ethics of vegetarianism, or of animal rights. The purpose of those omissions is not to brush off those concerns, but to point out that on ecological and economic grounds alone, meat-eating is now a looming problem for humankind. You don’t have to have any conscience at all to know that the age of heavy meat-eating will soon be over as surely as will the age of oil. Animal Agriculture and the Environment from NWVeg.org on Vimeo. Great writing. I’ve been following your blog. The issue you write about the cows reminds me of the human exploitation of this resource for the sake of the commercial Western valued culture ideals that sustains it. It’s happening in Africa and all around the world too. Also the private ownership of these industries puts it way beyond our hands as animal activists. It seems that all we can do is weep for the slaughter of the wolf pack. Great writing, keep it up. Thank you very much, Maria. I need to get caught up at your blog … I’ve been on sporadic hiatus from blogging, just out of poor time management. But I saw your series with the egret, that was very lovely. And yes, as far as private entities and their great influence on public policy, it’s disheartening at times. Our wildlife agencies are often beholden to those same interests and it can make for exasperating experiences for those of us who care about the well-being of individual animals, even beyond the considerations of species at large. Thank you, Bea. And yes, I obviously don’t blame the cows for our short-sightedness. In fact, I’ve always felt a big soft spot for cows. I spent some of my childhood in the Netherlands where fields of dairy cows covered big swaths of landscape. We interacted with them constantly, out on our bikes, exploring the heather fields and farms. This was long before I knew anything about factory farms which I researched much later in my young adulthood. My husband spent his first, young years on a family dairy farm and, farming considerations notwithstanding, has the same fondness for cows. I admit, the ear tags are tough for me to look at and photograph. I just find them objectionable for more reasons than one. I dislike the same brazen tags on wildlife, like the huge wing and neck tags I’ve mentioned in previous posts. There’s a disturbing commodification in it all, that we can attach any manner of signage to their bodies, even if the purpose is questionable.